At an early age, Angel Ken Young or Aky for short already had an affinity for building and crafting. His mom, Beth, tells SmartParenting.com.ph that his favorite toys as a kid were building blocks, and he graduated eventually to Legos and construction kits. He made it clear he wanted to create his toys from scratch. His dad, Ronald, who was an avid toy collector himself (his action figures and collectibles fill the house) indulged his son’s requests. Buying toys behind mom’s back and building them in secret became their bonding activity as father and son. As any parent who has bought a Lego for his kid knows, these toys can be expensive, but the couple felt their son’s mind worked differently than other kids. And it is this supportive nature that allowed their son to discover his talent at an early age. You see, at 12 years old, Aky is a certified robot builder who has been competing (and winning!) at local and international robotics competitions since he was 10 years old. Even more amazing is he learned the basics all by himself! At age 7, Aky began experimenting with his toys, especially with the ones with motors, to make them move. He also started watching programming videos (programming, or coding, is a basic skill needed by roboticists) on YouTube. It was at this point that he convinced his parents to buy him a Mindstorms EV3, a robotics kit from Lego. This robotics kit did not come cheap, and Beth, in particular, was hesitant at first. But she and Ronald eventually realized it would be a good investment. “Tinanong niya ako [Ronald], ‘Kailangan ba nating bilhin ‘yun?’ kasi gustong-gusto niya e. Sabi ko, kaysa bumili ng toy na wala namang kwenta, e di ‘yan na lang, may natututunan pa talaga siya,” Beth shares. It turned out to be a great investment. Aky learned how to build the robot EV3 right off the bat, aided by YouTube. Seeing his efforts, Aky's parents decided he needed formal training. They looked for a school that taught robotics and decided to transfer him to Diliman Preparatory School starting second grade. They also took advantage of the school’s summer robotics camp, so he would be able to adjust once regular school started. “Hinabol namin siya ng computer [classes] kasi sa previous school niya wala at all,” Beth says. While robotics classes were only taught to fourth graders and above, teachers saw Aky’s growing interest and allowed him to sit-in during classes while he was still in second grade. He was a shoo-in at the robotics club, which competed locally against other schools, by the time he reached the fourth grade. Acky showed off the skills he honed over the years in the competitions that the robotics club joined. 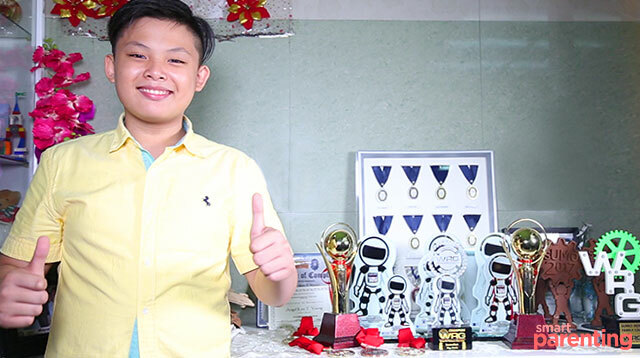 He started winning against other schools locally, and he became part of the team that was invited to compete at the 2016 World Robot Games held in Indonesia and again in 2017, which was held in Singapore. 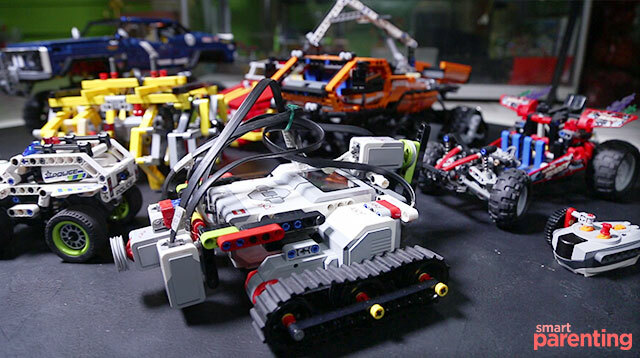 One of the categories Aky competed in is the “Sumo,” or droid wrestling, where robots called “sumobots” face off (Dohyo) and try to knock each other off the ring. His dad, Ronald, said that it could get very competitive — some players would try and destroy their opponent’s sumobot in the process of pushing them out of the ring. He recalled one Thai player who shouted, “Show no mercy! Kill!” at his robot during the 2017 World Robot Games. Even when faced with the toughest opponents, Aky’s parents say their son maintains his composure. To him, playing with robots is all about fun and games. “I just play around,” Aky says, adding he sometimes gets bored because he has to wait while a hundred players compete in one category. Beth and Ronald's emotional and financial support is akin to parents of budding athletes. They are making sure Aky has everything he needs to build robots. Yes, Aky's love for robots has not just become a bonding activity for the family — it's their way of life. The family living room has a Dohyo so Aky can practice with his sumobots and line paths so he can test the robots for line tracing. His parents are present in every competition, and even his matches abroad become family outings. His dad now competes in the World Games as a professional player (senior division for 19 years old and above) using the robots they build! 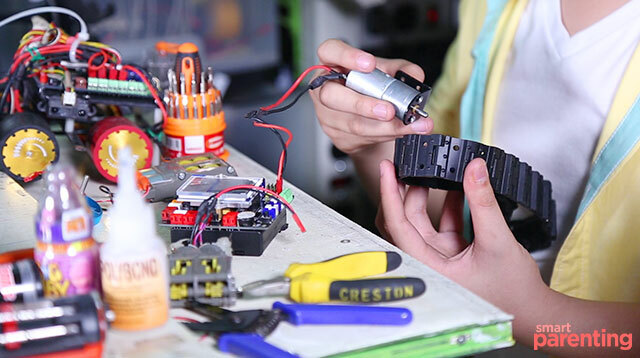 For Ronald and Beth, getting onboard Aky's passion for building robots wasn't just because of the recognition he got from winning international games. They saw the rewards their son was gaining, and it had nothing to do with popularity or money. Aky’s parents admitted they were overprotective of Aky when he was still young mainly because he was diagnosed with a G6PD deficiency, a genetic condition where his body did not make enough of the enzyme glucose-6-phosphate dehydrogenase (G6PD). This enzyme is essential for the proper functioning of red blood cells by protecting it from the potentially harmful by-products of a specific type of food, medication, and infection. (Read more here). Aky rarely went out of the house and had limited interactions with other kids. Aky slowly came out of his shell with robotics. Apart from building robots, he also participates in various extra-curricular activities. He's into photojournalism, and he is currently the president of his school’s student council. He now gets invited as a resource speaker by other schools to talk to students about his experience in robotics. For everything that their son has achieved, Beth and Ronald are just glad their son is growing up to be kind and well-rounded. It’s another reason why they just keep on pouring the support. “Kahit sa mga kailangan or gusto niya, hindi siya humihingi ng alam niyang hindi namin kaya. Usually ang kinukuha niya ‘yung nakabargain at lagi siyang magtatanong, ‘Pa, kaya ba natin ‘tong bilhin? '” Aky’s dad shares. Aky is still very much like a kid where the competitions he joins are just bigger playgrounds he can explore. And if he ever gets off track, you know, the "fame" gets into his head, you can trust that his parents will be there to push him back in the right direction. “Always be a blessing to others,” his dad adds.